GIS For Mac OS X Finally. 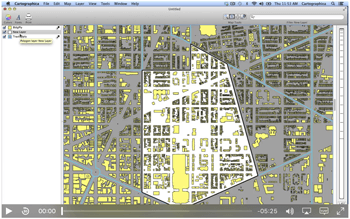 Cartographica 1.4 brings Macintosh GIS to the next level! ClueTrust is pleased to announce the immediate availability of Cartographica 1.4, the GIS for Macintosh. Come and try new style capabilities, new file formats, sophisticated new analysis tools, enhanced Map Layouts, and much more! Sign up for a free trial of Cartographica, or if you've tried Cartographica before, go to our Lost Key page and get a new trial key. We also have extensive Release Notes on the changes in 1.4 and check out our revised Features page to find out what's new. Cartographica is designed for people who need to work with geospatial data to create maps, analyze data, convert between formats, and discover new information about your data and the world in which it exists. As such, we have emphasized easy importation, exploration, analysis, and output in the design of Cartographica and hope that you find it powerful, yet fun to use and easy to explore. Learn how to take advantage of Cartographica's features. The screencasts are in QuickTime format and are viewable on desktop as well as iPhone OS devices.